We just went to our first country show! There were horses! Retro cars! Bulls that were about twice the size of our car! And Dagwood dogs. The big boy had his first Dagwood dog experience, I resisted but was lured by the curly potato on a stick thing. I wish we had kept cooler, had hats and a pocket full of dough, because everything seemed so expensive. Cue meltdowns when I had to start saying no to $10 quad bike rides. Something I wanted to check out was the craft, cakes, pickles and preserves. It was pretty busy, and all the displays of jars and flowers had large metal grills in front of them. Look how many fruit cakes were entered! I'm thinking pickles next year. Pickled cucumbers. In fact, these pickled cucumbers. My mother in law is something of a keen amateur in this field, and always enters something in the show, so I'm hoping for some good advice there as well. I didn't catch the knitted and crocheted items, the boys were keen to get outside and have another go on the rides. But I did see the quilting section in passing (at speed), that looked very popular. There were giant vegetables! 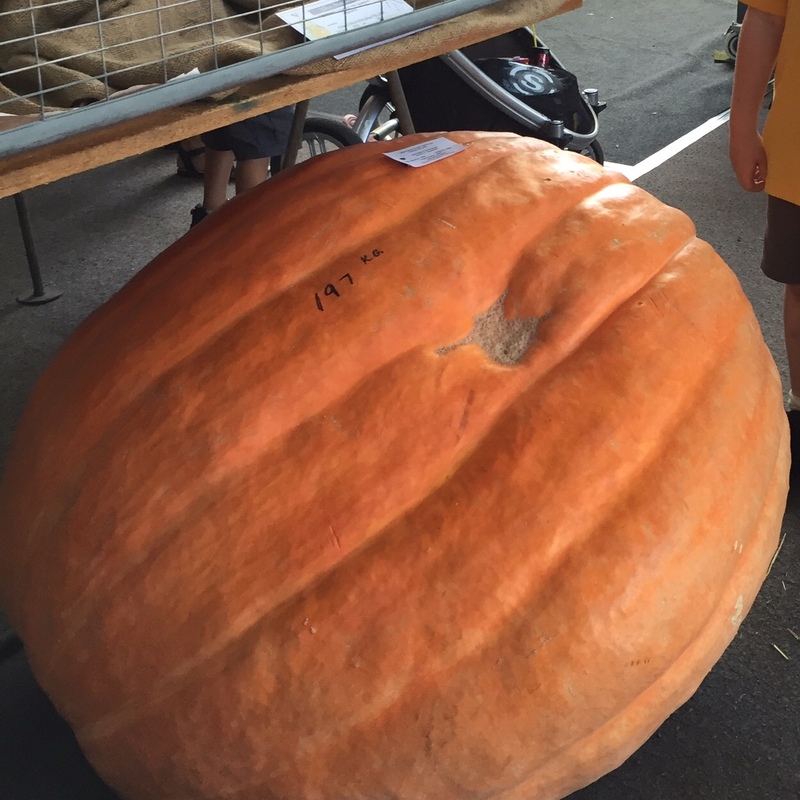 See how big that pumpkin is? Yes it was 197kgs! That little arm to the top right is the bigger boy. So here's to our first show, and my big plans to dominate in the pickled cucumber category next year. Looks like a fun day. I like proper country shows. I may have to send you some knitting to enter next year. I was going to offer my services as a pickle tester but realised that sounded dubious!